Our next general (evening) meeting will be on Monday April 29th, 7.30pm at the St Giles Centre, Lindridge Road. We are looking forward to welcoming Jane Howle, who will be giving a talk about Birmingham Airport. We will also have a presentation from Lisa Redfern about Bowen Therapy. ​Our Lotus Group, for those with secondary breast cancer, meets on the first Thursday of each month at 2.30pm at St Giles centre, Lindridge Road. The next meeting will be on Thursday April 4th. ​Sunday June 2nd: - Great Midlands Fun Run - will you be there supporting us, perhaps as a runner, a walker or an enthusiastic supporter? Wednesday June 19th: Ascot Day at Edwards' Restaurant, Cookes Furniture Store, Erdington. Race day, including extensive Afternoon Tea, including beer/wine. £30.00. Sunday October 13th: Breast Friends Annual Ball, Moor Hall Hotel. Featuring 'Baby Love', Motown tribute group. 3 course meal, black tie event. Tickets £42.50. Saturday October 19th: Afternoon Tea with fizz at Edwards Restaurant, Cookes Furniture Store. Tickets £12.50. Saturday November 23rd: Dinner Dance, Druids Heath Golf Club, Aldridge. 3-course meal with wine. Tickets £37.50. Sunday December 15th: Christmas Party Night, Moor Hall Hotel. Featuring DJ Paul Kelly. 3 course meal, with dress theme tbc. Tickets £27.50. Contact: Jackie (07771 359395) or Gill (07891 448527) to book for ticketed events. Everyone had a great night at the Gary Barlow Tribute Night at Moor Hall Hotel on Sunday 10th March. Moor Hall did us proud with a wonderful Carvery meal. ​We send a big thank you to our very generous guests who helped us raise over £1000 for Breast Friends. The Breast Friends Christmas Party at Moor Hall was a great success. It was a 60/70’s evening and everyone came suitably attired as can be seen from the fantastic photos posted on Facebook by Luis Cedeno our wonderful photographer. The evening raised an amazing £1500 we send a big thank you to all our very generous guests who gave their support. We also thank Moor Hall for providing the lovely food and looking after us so well. It was a wonderful evening! We enjoyed a wonderful festive evening on Monday 28th November 2018, our last General Meeting of the year. Ann Brown entertained us once more whilst creating some beautiful flower arrangements which we raffled off during the evening. Breast Friends shared a fabulous evening on Sunday 21st October at the annual fundraising ball - this year a masquerade ball with fireworks. Many thanks once more to Luis Cedeno for taking so many wonderful photographs of the event. These can be viewed and downloaded from this link. 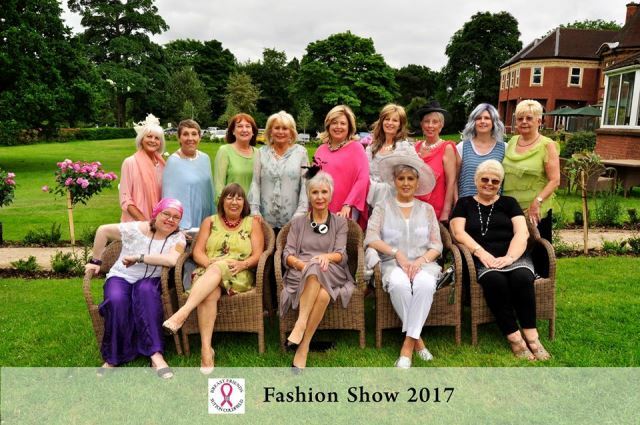 Thank you to everyone who supported our fashion show held at Moor Hall Hotel on Monday 11th June. Particular thanks go to Moor Hall who catered for us so well, the fashion houses Bee Bold Bee Beautiful at Atherstone and Foxy Lady from Halesowen, Ann Brown who donated the lovely orchids for our models and her friend Sue who helped with the models’ make up, also to Kerry Greaves who donated a lovely holiday to raffle, Julie Spriggs from Trendco, for supplying wigs for the models and Julie Gray and her daughter Ellie who helped out so much during the day. Finally a big thank to our vice chair Gill Harris and all the lovely ladies who came to support us. We raised just over £3000 which was the most we have raised from a fashion show. On behalf of all our patients, who will be benefiting from funds raised, than you all so very much! Well done and thank you to all members and supporters who took part in the Great Midlands Fun Run 2018 to support us. Thank you too, to those who cheered us on our way and/or sponsored any of our runners. Special mention must go to Adrian Simmonite & Team Maria, also to individual members and friends who ran and walked the course. Next year's Fun Run will be on Sunday June 2nd 2019 and registration is now open, so don't forget to book your place! 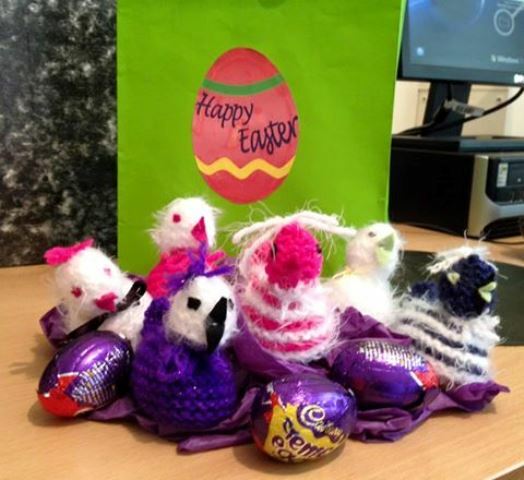 For the last few years we have raised funds by selling knitted Easter chicks with Creme Eggs kindly donated to us. Many thanks to Sainsburys Mere Green, Waitrose Mere Green and Asda Tamworth for their generous donations of cream eggs. We would also like to thank the lovely ladies who donated wool and knitted the chicks for us this year. The chicks literally fly out of the basket! Sending our grateful thanks to those who buy our chicks- a lovely start to Spring. If you'd like to make some for this year the pattern can be found here.